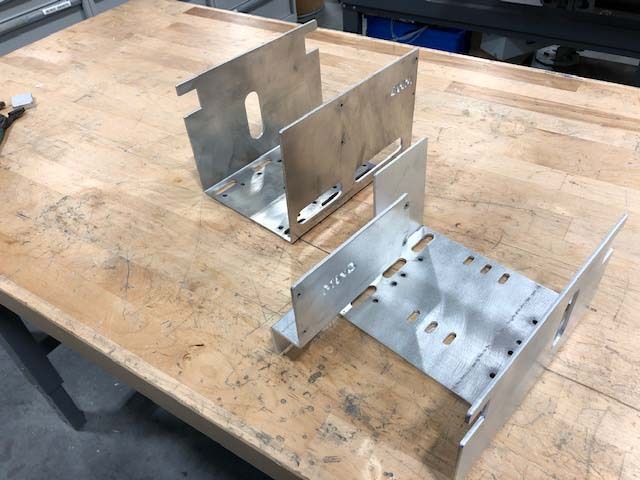 Made these brackets at work. They weigh 1.4lbs each. I cut over half a pound of wires off each rig so I actually added less than a pound. My goal was to have everything above the Losmandy plate travel as one unit. I just drop the unit on the mount and plug in two cables now....much nicer. I can switch between my laptop (via the USB hub on the mount) and the ASI air very easily. I really like how the bigger plate came out. I'd change a few things on the Stellarview plate if I did it again. Overall i'm happy with it.......and it looks cool. 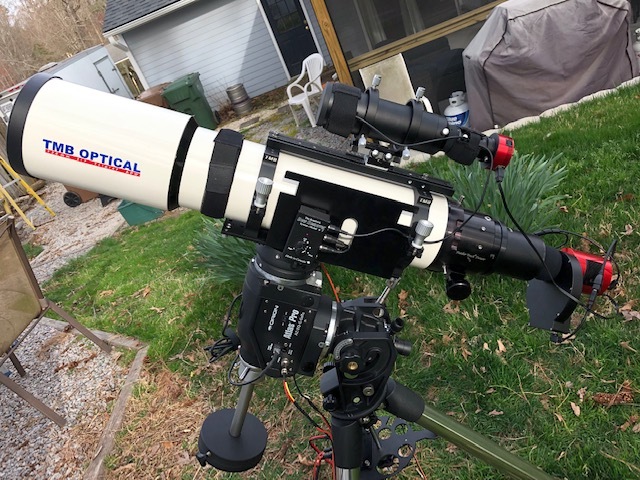 My next goal is to clean up the wires on the mount a little. I'm going to use the rig a few times first to see if I need to change anything first. Edited by chongo228, 16 March 2019 - 04:52 PM. 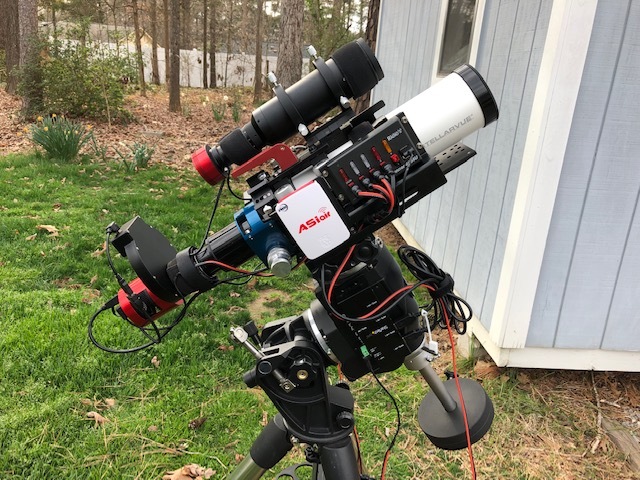 I did something similar that dramatically reduced my setup time, in anticipation of several dark sky trips I have planned this Spring/Summer. 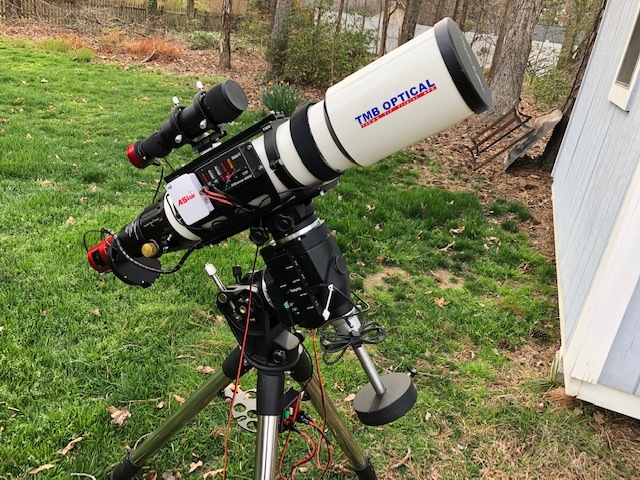 I have a side-by-side setup: a 135mm refractor and 80mm refractor. 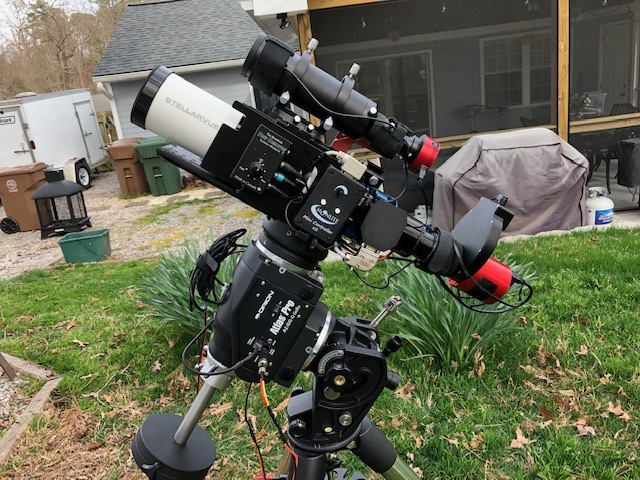 I put a flat plate on top of the 80mm refractor that holds all the electronics, minus the mini-PC which is on the pier/tripod. I bought a large case that is large enough to hold the 80mm and all the electronics as one unit. 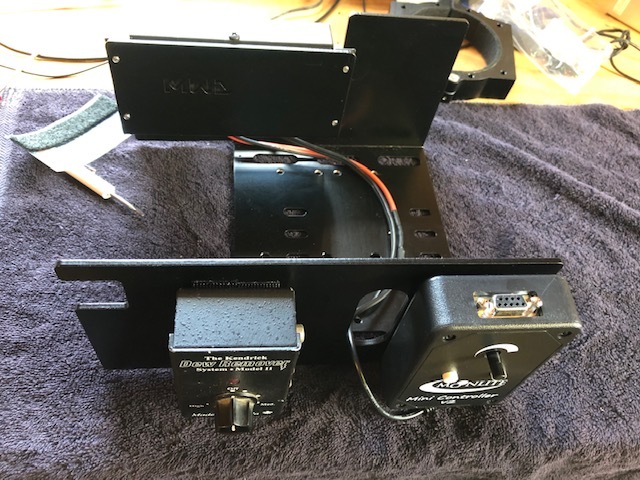 So all I have to do is unplug the USB cables and power cables from the devices, unplug the USB hub from the mount computer, and unplug the main power line to the electronics and just put the whole contraption in the case. Awesome Chongo ! I have the same mount. Really like your cable management. Great job on the bracket. So you have a Usb cable going to the laptop. Then for power is there a power source under the tripod? Oh duh, I see the ASI Air is your rasberry computer.  I was thinking about getting one but it doesn't work with Atik cameras. Very nice! However, I wonder how rigid your connection between guide scope and OTA is. You've got rings, a dovetail bar that can slide in a shoe, a small aluminum block, and another dovetail bar. That may make your rig more prone to flexure. My set-up and cable management is similar, but has a simple flat aluminum plate that carries the guide scope, 12V power strip, dew control, and USB hub. I was concerned about flexure so I eliminated the rings on the guide scope and just used stainless steel strap clamps to secure it to a Vixen dovetail bar. I don't need to aim the guide scope so was happy to give up the rings. I'll go grab a pic of this and post shortly so you can see what this looks like. 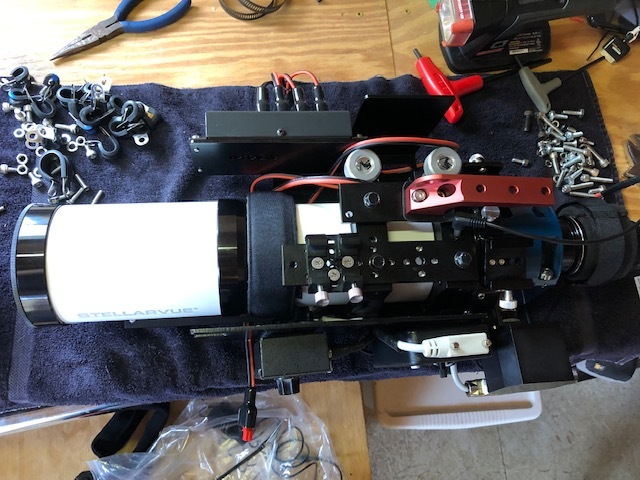 The shoe for the finder scope is bolted to the vixen rail. I used it over a flat plate because I had it just sitting around....I've used this setup for 2 years now and flexing hasn't been a problem. The tripod had a power distribution block mounted to the spreader plate. I have a waterproof 12v power supply that I can leave strapped to the leg of the tripod. 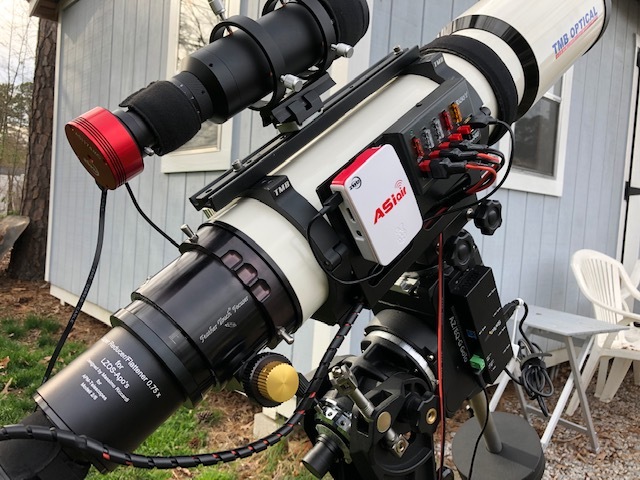 The power block supplies the mount and the scope....i'm planning on mounting some red LED lights to the tripod that will be powered by the block for when I need light in the field. Excellent idea! Those brackets look like they are begging to be 3D printed.